Acta Cryst. (1997). A53, 531-534. 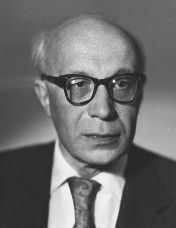 Professor Boris Konstantinovich Vainshtein, a prominent crystallographer, died suddenly on 28 October 1996. Three months earlier, he had celebrated his 75th birthday, full of energy and creative plans, as Head of the Laboratory of Protein Crystallography of the Institute of Crystallography, Russian Academy of Sciences, and Director of the Institute. His scientific work was devoted to electron diffraction and X-ray structure analysis, electron microscopy, and theory and techniques of the crystal structure of matter. They covered a wide rage of problems of symmetry, properties and growth of crystals. B. K. Vainshtein and his pupils performed structure determinations of many inorganic, organic and biological compounds. A wide range of scientific interests, the talent of a theoretical physicist, experimenter and engineer, an ability to analyse profoundly, clearly formulate and solve complicated scientific problems in many branches of solid-state physics, structural chemistry and molecular biology, the ability to understand technical and applied problems of crystallography and crystal physics, an outstanding skill to organize people - all these features are components of the scientific creative activity of Boris K. Vainshtein. Boris K. Vainshtein was born on 10 July 1921 in Moscow, where he lived all his life. He lived and went to school on Arbat street, one of Moscow's old central streets. This corner of old Moscow, its inhabitants and the school gave a specific colouring to his cultural views and Arbat remained forever his favourite place for leisure and walks. Boris Vainshtein exhibited his gifts and abilities in his early school years - he was an eager, bright pupil, interested in mathematics, physics, literature and history; he drew a lot, was fond of playing chess, wrote poems. He did all that quickly, naturally, easily. This peculiar ease and clarity, an ability to respond most naturally to many complicated situations, in science and in life, to resolve complex tasks and problems was a distinguishing feature of Boris Konstantinovich as a man and a scientist. Boris Vainshtein graduated from two Moscow higher educational institutions, the Department of Physics of Moscow University (in 1945) and the Institute of Steel (in 1947). Later, the engineering background helped him a great deal in his physical and crystallographic studies. From 1945 until his last day, Boris Vainshtein had been working at the Institute of Crystallography of the Russian Academy of Sciences, where at the same desk he passed all the stages of his scientific career: post-graduate of the Laboratory of Electron Diffraction (1945-1948), scientist at the same Laboratory (1948-1958), founder and Head of the Laboratory of Protein Structure (1959-1996), Director of the Institute (1962-1996). All his scientific creative activity has been closely linked with the Institute of Crystallography to which he gave over 50 years of his life. This concentration is also a distinctive feature of his personality, his integrity. More than once he rejected attractive and flattering offers to become a Chair at Moscow University. As he often commented, that would have distracted him from his work at the Institute. To remember Boris Konstantinovich and his creative work means, to some extent, to describe the life of the Institute of Crystallography. When Boris K. Vainshtein began working at the Institute in 1945, it contained a small scientific team headed by its founder, Professor A. V. Shubnikov. At that time, the famous scientists Professors N. V. Belov, Z. G. Pinsker, G. G. Lemmlein, M. V. Klassen-Neklyudova and N. E. Vedeneeva were there. These people had created the nourishing environment where the scientific style of young Boris Konstantinovich was raised. In his turn, Boris Konstantinovich returned in full his `debt' to the Institute: in recent decades, the Institute of Crystallography has been a leading Institute of the Russian Academy of Sciences, which was a result of his efforts of many years, both creative and organizational. In the former USSR, and now in Russia, to be Director of the Institute is a much more difficult and complicated job than a similar position in the West. `A poet in Russia is more than a poet' wrote the famous Russian poet Yevgeny Yevtushenko. This saying may be paraphrased, referring to science, that a director of a scientific institution is more than just a director. Boris Konstantinovich managed, under the conditions of a totalitarian soviet system, to gather a great number of bright, distinguished and active researchers and to provide maximum favourable conditions for their creative work. First, Boris Vainshtein's scientific attention was drawn to electron diffraction. He retained this interest until his last days. His final presentation at a scientific conference in Sweden in June 1996 was devoted to electron diffraction from thin organic films, Langmuir-Blodgett films. Back in the 1940's, he managed to reveal the extraordinary and unusual opportunities of this technique for the determination of the crystal structure of matter and to create structural electron diffraction in its current form. In 1948, he used, for the first time, the Fourier synthesis of the electric potential of a crystalline lattice. In 1953, he published a paper that later became a classical work where he calculated amplitudes of elastic electron diffraction from atoms. Later, jointly with J. A. Ibers, he created tables of such amplitudes. As Professor N. V. Belov wrote, `of crystallographic electron diffraction which had been before just a demonstration of nice highly symmetrical pictures from simplest substances, B. K. Vainshtein made electron diffraction an accurate science, a powerful tool for solving complex objects'. He generalized results of his studies in a monograph Structural Electron Diffraction (1956), published in English in 1964. This book remains today a standard reference for most specialists on electron diffraction in many countries. Also at this time, the beginning of the 1950's, Boris Konstantinovich turned to solving general problems of structure analysis, irrespective of the nature of the primary radiation. This direction became a leading one for him for quite a long period of time. The style of the theoretical works of Boris Konstantinovich of those times as well as the style of his later works is unusual. In a brief introduction, he would describe the essence of the problem, practically from the very beginning, using clear physical presentations and mathematical formulas, then he immediately acquainted the reader with a formulation of the problem and suggested the solution. In those distant times, Boris Konstantinovich suggested a simple (different from Wilson's) technique of `normalizing electron density on the basis of the law of intensity preservation' and derived formulas for calculating diffraction peak heights and accuracy of determination of atomic coordinates in the unit cell. Gradually, a team of his pupils and co-workers, both at the Institute of Crystallography and in the `neighbouring' physical, chemical and geological institutes, began concentrating around Boris Konstantinovich. This allowed the `informal', as they say now, groups to use electron diffraction (later X-ray and neutron diffraction) structure analysis as a new approach to the analysis of the crystal structure of matter. They were used in structural studies of barium chloride hydrate, transition metals, diketopiperazine, n-paraffins, thiourea, polymers, liquid crystals and synthetic polypeptides. At the end of the 1950's and at the beginning of the 1960's, Boris Vainshtein paid special attention to structural studies of polymers, liquid crystals and other disordered systems. In 1963, he published his monograph X-ray Diffraction from Chain Molecules, which played an important role in the development of structural studies of polymers in many countries. This book reports not only original results obtained by the author but also, most importantly, a clear, profound and general analysis of the whole problem. Until the appearance of this book, in the literature there had only been solutions of various particular (sometimes rather complicated) problems of the theory of diffraction of short waves from chain molecules, sometimes with vaguely formulated limitations and allowances, obtained by different techniques. In this monograph, the author, `similarly to Dante, goes down from heaven of a totally crystalline character through purgatory of various disordering to the depths of a complete ideal chaos' as Max Perutz, a classic of protein crystallography, wrote in his introduction to the edition of the book in English in 1966. In the 1950's, the first visits of Soviet scientists abroad became possible and Boris Vainshtein began interacting actively with western crystallographers. His attention was focused on studies of the determination of protein structures using X-ray analysis techniques. At that time, there was not a single determination of a space structure of a protein molecule, although such works, initiated in England at the end of the 1930's by J. D. Bernall and W. L. Bragg, were performed successfully in groups headed by M. Perutz and J. Kendrew. Apparently, the interest of the young Boris Konstantinovich in protein crystallography to a large extent was caused by the influence of the British crystallographic school. In 1959, with support by A. V. Shubnikov, Boris Vainshtein founded a Laboratory of Structure of Proteins at the Institute of Crystallography. It was a courageous decision. At that time, there was no solid basis for solving this task in Moscow, there were no crystalline or crystallized proteins in amounts sufficient for research, there were no X-ray diffractometers for such large unit cells, there were no computers or software (and no maintenance), and there were no researchers at least partly prepared for performing all the complicated stages of solving protein structures. It is only Boris Vainshtein himself who could answer the question why he took the risk of establishing such a laboratory. Perhaps the answer is in the individual feature of his scientific style and his personality. For him, there was no psychological barrier when he was facing the unknown, either in solving a scientific or engineering problem or dealing with an organizational or everyday life situation. It was natural for him to approach and solve theoretical and mathematical tasks, to perform by himself experimental research, primarily electron diffraction studies, to design and make general schematic drawings of an electronograph for the laboratory, which was soon manufactured in the workshops, and many other things. In 1959, having practically nothing available, no equipment, no researchers, no space, he tackled problems of protein structure, which, in principle, seemed hardly likely to be solved. In contrast to western researchers engaged in protein structure studies, he did not confine himself to X-ray structure analysis of protein single crystals, he decided to also use electron diffraction and small-angle X-ray scattering to study the structures of biopolymers in solution. Here, a distinguished feature of his talent was very helpful. Crystallographers, as well as other naturalists, can be divided into two groups. For the first group the methodical aspect is the most important - the search for new techniques of studying the object. The second group is concerned with the search for concrete regularities of the structure of the object and penetration into the depth. In other words, the questions are how to study or what to study. Boris Vainshtein used both approaches, the first being predominant. The first protein object studied by the group headed by B. K. Vainshtein was leghaemoglobin, a legume protein from yellow lupin with the molecular weight of 17000Da. Only in 1974 was the structure of the molecule successfully solved with a resolution of 5 Angstrom. This achievement (at that time it seemed rather modest compared with the work performed at Cambridge) was the beginning of the successful development of protein crystallography in Russia. Later, a detailed structure of the protein was solved at a higher resolution of 2 Angstrom, coordinates of all 1200 non-hydrogen atoms were calculated, complexes of the protein with various ligands were found, as well as structural changes in the protein molecule due to attachment of oxygen atoms. These results allowed studies of the structures of large molecules such as aspartataminotransferase, inorganic pyrophosphatase, catalase and ceruloplasmine. B. K. Vainshtein and his co-workers determined structures of 30 protein molecules and over 40 of their modifications. In the 1980's and 1990's, the structure of the carnaton virus was studied at Professor Vainshtein's laboratory with a 3.5 Angstrom resolution. Simultaneously with being the leader of studies in protein crystallography, Professor B. K. Vainshtein was actively working as a theoretician of structure analysis, mainly in the theory of analysis of electron microscopic images. Here he obtained the most important results. He discovered an algebraic method for the reconstruction of a three-dimensional structure of the object from its projections (A. Klug and D. De Rosier used the Fourier technique for that), that is, determination of the shape of a body by summation of the projecting functions (later Boris Konstantinovich discovered that this technique could be improved using a mathematical operator derived by the German mathematician Radon in 1916). Using this technique, structures of many bacterial viruses and large proteins were solved. In 1962, B. K. Vainshtein became Director of the Institute of Crystallography; he set forth the strategic goal of creating science that describes structure, growth and properties of crystals, the science that unites these directions and develops techniques for predicting properties and control of crystal growth, proceeding from their real and ideal structure. It is in this close combination of various approaches to studies of crystals that B. K. Vainshtein saw the pathway for development of modern and future crystallography. Professor Boris K. Vainshtein had a talent for being an outstanding organizer, manifested by his position as Director of the Institute. He supported traditional directions of crystallography as well as new ones, having created a large number of new laboratories according to new directions in modern crystallography, both theoretical and applied. Among them there are Laboratories of Liquid Crystals, Electron Microscopy, Small-Angle Scattering, Laser Crystals, X-ray Optics, Synchrotron Radiation, High-Temperature Crystallization etc. For many years, crystallography as a science was supervised by Boris Konstantinovich, first in the USSR, then in Russia. Since 1961, he had been a member of the Editorial Board of the journal Kristallografiya; from 1982 he was the Editor-in-Chief. For many years, he was Chairman of the Scientific Council on Crystal Physics of the Russian Academy of Sciences, a member and, from 1984, Chairman of the National Committee for Russian Crystallography. He was Vice-Chairman of the Secretary Academician of the Department of General Physics and Astronomy (1990-1996), supervising studies in solid-state physics in Russia. From 1957, B. K. Vainshtein actively participated in all Congresses of the International Union of Crystallography, he was Chairman of the Organizing Committee of the VII International Congress of Crystallography held in Moscow in 1966, and he was a member of the Executive Committee (1969-1975) and Vice-President (1975-1978) of the IUCr. He was highly esteemed by crystallographers all over the world. In 1990, he was awarded the Ewald medal and prize, the highest award of the IUCr. As one can see from a brief list of his works, Boris Vainshtein can be called a scientist of encyclopedic knowledge in the field of structure analysis of matter by short-wave diffraction. He has greatly contributed to various aspects of the theory and practice of structural techniques, ranging from scattering theory to the design and manufacture of equipment. integration of crystallography as part of the world scientific progress in natural sciences: writing monographs, reviews, popular scientific articles. As time passed by, the share of the first item (probably, the most important one) was decreasing, while the shares of the other items were increasing. But the first component was always creative and intense. `There is wine for each age and the wines should not be mixed' wrote Leonov, a Russian writer. The 50-year creative activity of Boris Vainshtein is a bright demonstration of this rule applied to crystallography. Boris Konstantinovich, as an individual, was a highly harmonic person, not only at work. His family, his wife Nina, daughter Olga and son Sasha, always meant very much to him. Home, upbringing of the children and leisure with the family held a place no less important than his scientific creative activity. One definition of happiness can be referred to him perfectly: happiness is when you want to go to work in the morning and feel like going home in the evening. The passing away of Boris Vainshtein is a heavy loss for his family, friends and colleagues. The name of Boris K. Vainshtein will remain forever in the history of Russian and world crystallography.